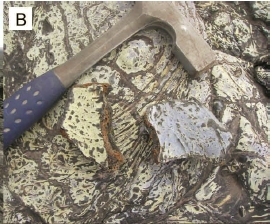 Young basalts from Kīlauea Volcano, Hawai'i, frequently feature opaque surface coatings, 1–80 μm thick, composed of amorphous silica and Fe–Ti oxides. These coatings are the product of interaction of the basaltic surface with volcanically-derived acidic fluids. Previous workers have identified these coatings in a variety of contexts on Hawai'i, but the timescales of coating development, coating growth rates, and factors controlling lateral coating heterogeneity were largely unconstrained. We sampled and analyzed young lava flows (of varying ages, from hours to ~40 years) along Kīlauea's southwest and east rift zones to characterize variation in silica coating properties across the landscape. Coating thickness varies as a function of flowage, flow surface type, and proximity to acid sources like local fissure vents and regional plumesemitted from Kīlauea Caldera and Pu'uŌ'ō. Silica coatings that form in immediate proximity to acid sources are more chemically pure than those forming in higher pH environments, which contain significant Al and Fe. Incipient siliceous alteration was observed on basalt surfaces as young as 8 days old, but periods of a year or more are required to develop contiguous coatings with obvious opaque coloration. Inferred coating growth rates vary with environmental conditions but were typically 1–5 μm/year. Coatings form preferentially on flow surfaces with glassy outer layers, such as spatter ramparts, volcanic bombs, and dense pahoehoe breakouts, due to glass strain weakening during cooling. Microtextural evidence suggests that the silica coatings form both by in situ dissolution–reprecipitation and by deposition of silica mobilized in solution. Thin films of water, acidified by contact with volcanic vapors, dissolved nearsurface basalt, then precipitated amorphous silica in place, mobilizing more soluble cations. Additional silica was transported to and deposited on the surface by silica-bearing altering fluids derived from the basalt interior.